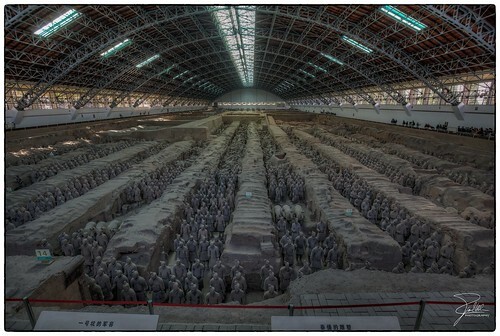 Interesting story of buried terracotta army of Qin Shi Huang, first Emperor of China. No two terracotta warrior figures in this vast army were completely identical. Do you know why? Their burial site is now a prominent UNESCO world cultural heritage site. “Where are we going today?” asked Isha, when she was finally ready for the day. “To see terra cotta warriors,” Rosh answered, as they boarded a local bus to the Xi’an Train Station. “Terracotta warriors?” Isha was puzzled. “Ya,” smiled Rosh. “The Terracotta Army is a collection of terracotta sculptures of the army of Qin Shi Huang, the first Emperor of China." “Did you know that Qin is pronounced Chin. So, some scholars have theorised that the word China and its earlier related forms were ultimately derived from the state of "Qin", the westernmost of the Chinese kingdoms during the Zhou dynasty which unified China to form the Qin dynasty." “Tell me more about these Terracotta warriors!” Isha commanded, as she looked out of her tourist bus window at the scenic route to the Mausoleum from Xian train station. “All terracotta warriors found, are life-sized. Besides height, they also vary in uniform and hairstyle, in accordance with rank. We now know that the warriors’ gear was originally also painted with bright pink, red, green, blue, black, brown, white and lilac pigments." "Most of the figures also originally held real weapons such as sharp spears, swords, or crossbows. Some of these weapons, such as the swords were coated with a 10–15 micrometre layers of chromium dioxide, which has kept these swords rust-free for 2,000 years." "Dating from 3rd century BC, the 8,000 soldiers, 130 chariots with 520 horses and 150 cavalry horses (estimated figures), the majority of which remained buried in three pits near Qin Shi Huang's mausoleum, were probably buried there to help guard his empire in his afterlife." “Haven’t they dug it all up yet?” Isha was surprised. “Most of the tomb remains unopened to this date, possibly due to concerns about preservation of its artifacts. For example, after the excavation of the Terracotta Army, the painted surface present on some terracotta figures began to flake and fade." "The lacquer covering the paint can curl in fifteen seconds once exposed to Xi'an's dry air and can flake off in just four minutes. That’s probably why so far, only about four main pits have been excavated approximately 7 metres deep." "Pit one, the largest pit discovered at 230 metres x 62 metres, contained the main army of more than 6,000 figures. It had 11 corridors, most of which are more than 3 metres wide and paved with small bricks with a wooden ceiling supported by large beams and posts." "This design was also used for the tombs of nobles and would have resembled palace hallways when built. The wooden ceilings were covered with reed mats and layers of clay for waterproofing, and then mounded with more soil raising them about 2-3 metres above the surrounding ground level when completed." "Construction of this tomb was described by historian Sima Qian. In his most noted work, Shiji, written a century after the mausoleum's completion, Sima Qian says that work on this mausoleum began in 246 BCE, soon after Emperor Qin had ascended the throne, and the project eventually involved 700,000 workers." “For years,” said Rosh, “pieces of terracotta figures, fragments of roofing tiles, bricks and chunks of masonry had reportedly been found in this area, but not much attention was paid to these by archaeologists." “The first piece contained a driver with two seats in the chariot with a bronze umbrella. The second piece had a separate carriage. Both pieces were about 50% of the size of a real horse." "When the artifact was first found it was in broken pieces. It took five years to restore both the chariots together. Interestingly, this bronze chariot is one of 64 designated historical artifacts that are prohibited from ever leaving Chinese soil."